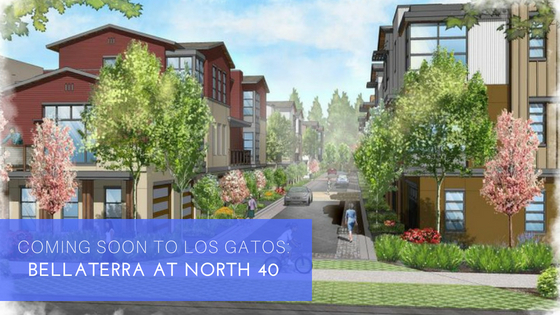 SummerHill Homes is proud to announce Bellaterra at North 40, a new home community coming soon to Los Gatos. This stunning community will offer 253 homes with open bright floor plans, loft living, terraces, and outdoor spaces. The Towns: 80 condo clusters with 1-3 bedrooms and approximately 1,039-2,089 square feet. The Rows: 97 rowtowns with 2-3 bedrooms and approximately 1,508-1,974 square feet. Bellaterra at North 40 is located at Lark Avenue and Los Gatos Boulevard and will have centralized community gardens where residents can come together to learn and grow, as well as interwoven paseos through the neighborhoods. Celebrating Los Gatos’ history, agricultural heritage, hillside views and small-town character, there are multiple gathering spaces surrounded by orchards where you can dine, unwind and unplug, enjoy bike paths and nearby retail stores and so much more! We encourage you to join our Interest list to receive updated information on floor plans, pricing and our Grand Opening as information becomes available. You can learn more about Bellaterra and join the interest list on our website at SummerHillHomes.com.